Supervisor Andrea McGimsey announced in the May edition of her Potomac District Newsletter that the Loudoun Board of Supervisors, at their May 18 meeting, approved $27,000 for design of pedestrian and bicycle facilities along Atlantic Blvd from Route 7 to Magnolia Rd. These facilities will connect with a VDOT project to widen Atlantic Blvd from Magnolia Rd to Church St and the W&OD Trail. The recommendation is for a 10' paved trail on the eastern side of the road and a 5' sidewalk on the west. The option of adding 5' on-road bike lanes to Atlantic Blvd was also studied by Dewberry & Davis. The design cost alone was estimated to be over $500,000. Unfortunately no other options were studied such as narrowing the travel lanes and using wide curb lanes that would also provide on-road bike facilities at a much lower cost. I encourage you to send us your feedback on an ongoing basis about where we need make improvements for multimodal transportation – walking, biking, and public transit. Photographs and video of dangerous situations are very helpful, as well as detailed descriptions, for the staff following up on your ideas and concerns. We may not be able to address issues right away, but having a comprehensive list of needs is a great help in prioritizing where to put our limited tax dollars and what to ask developers to include in their proposals. 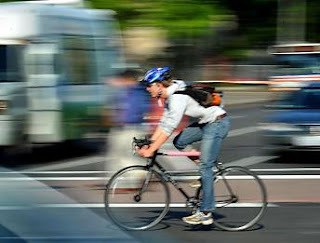 You can send your ideas and support for bicycle and pedestrian safety to the Board of Supervisors at bos@loudoun.gov and to me at Andrea.McGimsey@loudoun.gov. Early this morning, after a long meeting that ended past midnight, by a vote of 10-1 the Fairfax County Planning Commission approved plans to transform Tysons into a walkable, bikeable transit-oriented community. Dranesville Commissioner Jay Donahue was the lone dissenter. He had wanted to ensure that the 20 athletic fields planned for Tysons were restricted to just the Tysons area and didn't spill over into the Dranesville District. The marked up plan (not yet online) includes several recent bicycle-related changes (while we had to leave the meeting before these items were discussed, we'll assume they were approved in the final motion). Under Land Use Monitoring, a process for monitoring progress for achieving the vision for Tysons, a new bullet was added: "Progress toward implementing facilities for pedestrians and bicyclists." The most far-reaching changes are in Table 8, Transportation Infrastructure, Programs, and Services. Previously there was no mention of bicycle infrastructure. While bike lanes are included in the grid of streets, and both the bike lanes and grid will make conditions better for bicycling, many more improvements are needed to make Tysons bike-friendly. Two new entries are now included in the table. Item II, Required Additional Transportation Improvements to Accommodate 60 Million Sq. Ft. of Development (2013-2020), E. Misc. Improvements: Bicycle Access Points—Bicycle connections into and out of Tysons—Tysons-wide. This same language is included under item III, 2020-2030. With the inclusion of this language it's more likely that dedicated funds would be available for the many relatively low cost bike improvements needed in Tysons. Kudos to the Commission, to county staff, for making these changes, suggested by FABB and others. And thanks to cyclists who took the time to speak out for better bike facilities in Tysons. However, the same language is need in item I, Transportation Improvements To Be Completed by 2013. Bike facilities are needed between now and when the stations open. The only parking at the stations will be for bikes, and cyclists need better facilities now to allow them safe access to the stations. Cyclists will have one last chance to weigh in on these changes, to support the new bicycle-related language and to ask that bicycle connections into and out of Tysons be developed between now and when the stations open. The Board of Supervisors will hold the final public hearing on June 22. You can sign up to speak at that public hearing (application number ST05-CW-1CP). According to DC Indymedia a white ghost bike has appeared at the site of the fatal bike crash at the corner of Forum Dr and Lee Hwy/Rt 29 just south of the Fairfax County Government Center, where 18-year old Abdelouahid "Abdul" Chadli was killed. A ghost bike "is a bicycle set up in a place where a cyclist has been hurt or killed by a motor vehicle, as a roadside memorial." Several items have already been placed at the site as you can see in the background of the photo. When I stopped by there on Tuesday a small crowd was gathered and we've heard there have been people visiting the site daily. On Sunday members of the Fairfax High School wrestling team gathered at the site to mourn Chadli's death. Fairfax County owns the land on which the Reston East Park & Ride lot is located. This lot is adjacent to the planned Wiehle Ave Metro station on the new Silver line. As we noted in an earlier posting, a major mixed-use development is being proposed on this site, which is very close to the W&OD Trail. My name is Bruce Wright and I live within a mile of the proposed development. While in general I support this application, bicycle access to the site is not well-planned and some facilities recommended by the Reston Metro Access Group are missing. While several pedestrian circulation diagrams are included in the application, bicycle circulation has not been properly planned. Bicycle access and pedestrian access issues are different but developers and others often assume that the same facilities serve both users. I met with the applicant and when I asked how cyclists would access the 150 Metro bicycle parking spaces I was told they would get off their bikes and walk on the sidewalk with pedestrians. That likely won't happen. In this and future applications around Metro stations I suggest that bicycle as well as pedestrian circulation be planned and facilities be provided to reduce bicycle/pedestrian conflicts and provide safe passage for cyclists. According to the RMAG report, a shared bus/bike lane is recommended on Comstock Metro Center Drive from the W&OD Trail to the station entrance. Bike lanes are recommended on Reston Station Blvd through the site. The trail along Wiehle Ave is recommended to be 10 feet not 8 feet. 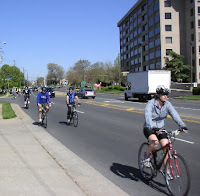 According to the report: "The sidewalks along Wiehle Ave between the station entrance and the connection to the W&OD Trail should be wider than in other areas to accommodate larger numbers of bicyclists." From what I have seen, these recommendations are not being met. The RMAG recommendations were developed by VHB and finalized by the RMAG which included VDOT and county DOT staff. If there were reservations about the recommendations, they should have been expressed at that time. If we can't get good bicycle access at this Metro site, adjacent to the W&OD Trail, it's not a good sign. I also think that providing 1 bicycle parking space per 20 residential units is insufficient. Arlington Co uses 1 space per 5 units and in Tysons we are using 1 space per 10 units. Since the county currently has no guidelines for bicycle parking, I believe that more detailed guidance about number, placement and type of bicycle parking is needed within the residential and commercial buildings. In response to my comments about insufficient access to the site, the applicant said that an 8-foot asphalt trail along Wiehle Ave is sufficient for bicyclists and pedestrians. He also said that "we have made our lanes somewhat larger to try to facilitate bicycle access. Our curb lanes in front of the project will be 14-feet not 12-feet to give a little additional room for bicycle access. Ultimately I think the creation of bicycle lanes is something that can occur with development to the north and east of us occurs and provides additional right of way. The site is somewhat constrained by the available right of way willingness or ability of MWAA to condemn additional right of way." Having wide curb lanes through the site will help bicyclists, but the 8-foot shared path from the W&OD to the site is not sufficient for bicycle and pedestrian access, especially during rush hour, and the county should have forced the developer to adhere to the RMAG recommendations. • Where feasible, the applicant will provide additional bicycle racks and storage in the commercial garage or in buildings for use by the patrons of the private development by demand. Locations for these facilities shall be determined jointly by the applicant and the County’s Department of Transportation at the time of site plan submittals for the proposed phases of development. • A minimum of one male or female shower facility shall be provided in each office building. While the two conditions are welcome, they are much less than what is required in Arlington Co. Without bicycle parking guidelines, the county is forced to negotiate with each developer and has no real leverage in these negotiations. The phrase "where feasible" in the first bullet will likely mean "never" and is vague and difficult to track and subject to employees having to demand additional facilities. For every 50,000 square feet of commercial development Arlington requires "one (1) shower per gender shall be installed, up to a maximum of three (3) showers per gender. Also, a minimum of one (1) clothes storage locker per gender shall be installed for every required employee bicycle parking space." The guidelines go on to give specifications for lockers including size and placement. 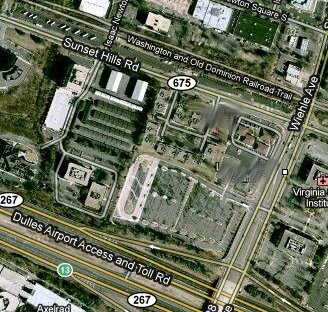 In Fairfax it's up to the whim of the developer to decide the kind and location of these facilities. While we think the county is getting close to a first draft of the bike parking guidelines, they can't some soon enough. The ViVa! Vienna! 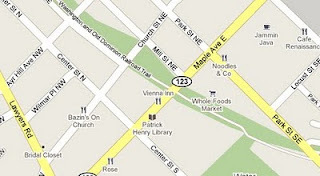 festival is held on Memorial Day weekend in downtown Vienna, adjacent to the W&OD Trail. Don't expect to be able to ride on the trail through Vienna this weekend. You can avoid the crowds by making a detour around the festival. If coming from the east on the trail, take a right on Park St headed northeast (at the Vienna Community Center) to a left on Church St, right on Mill St, Left on Ayr Hill then right on the trail. Reverse these directions if coming from the other direction. Better yet, why not park your bike in one of the bikes racks on the Vienna Green that were donated by bikes@vienna and take a few minutes to visit the festival. Both bikes@vienna and Spokes, Etc. are located nearby. 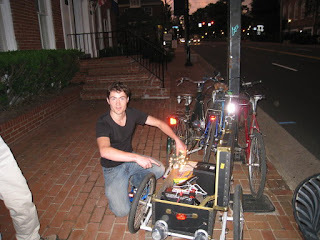 May 25, 2010 – The Washington Area Bicyclist Association is pleased to announce the appointment of its new Executive Director Shane Farthing. The organization completed a thorough and extensive nation-wide search and selection process. Shane Farthing is a lawyer, policy analyst, weekday bicycle commuter, and weekend recreational cyclist. Formerly the head of the Office of Green Economy within the District of Columbia’s Department of the Environment, Shane has been involved in the environmental planning and development of many of the projects currently changing the face of the District. In addition to his detailed understanding of infrastructure and land development policy, Shane comes to WABA with an understanding of the larger social and environmental benefits of cycling. When not biking, Shane spends his time kayaking, camping, following the slow-but-steady improvement of the Nationals, and trying to make his 1912 rowhouse “greener” on the cheap. Shane possesses graduate degrees in law and public policy from the George Washington University and a Bachelor’s degree in Religious Studies from Virginia. He is admitted to the New York Bar. Shane will assume his executive director responsibilities with WABA on June 3rd. Update: Read an interview with Shane on Greater Greater Washington. According to an article in today's Post, Law firm starts bike rental program for its employees, a law firm in Alexandria just started their own bike sharing system. Employees can check out one of three bikes stored on-site for short trips around town. Companies don't need to wait for a regional bike sharing system, they can start their own. National Wildlife Federation in Reston, which won the Bicycle-Friendly Employer Challenge at Reston's Bike to Work Day, has had a small fleet of bikes for it's employees for many years. 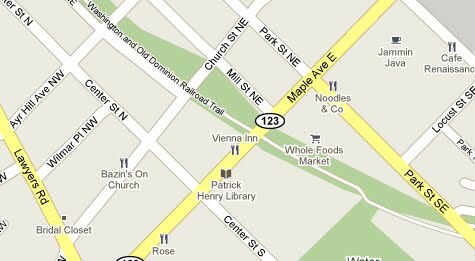 They are located adjacent to the W&OD Trail. They are also at the end of a long business park cul-de-sac, so trips in the car involve a much longer distance than just hopping on the trail to eat lunch or run nearby errands. There were many comments about breaking rules and behaving poorly in the May 20 Metro article "Cyclists, drivers struggle to chart road rules." But there was no discussion about the lack of a system of bike education. When little instruction is provided, we should not be surprised that some road users don't conduct themselves well or know all of the rules. Comprehensive school bicycle curricula abound in Europe. I recently visited a Belgian program where 10-year-olds receive 30 hours of bicycle training during the school year. The students spend 20 hours riding in traffic, and they have to pass a four-kilometer road test. With this level of education, students are likely to grow up to have a much better understanding of bicycles in traffic, whether they are riding or driving. The successful bicycling that can be seen in Europe is in part a reflection of a commitment to teaching the population how to share the right of way. We instruct our 16-year-olds on how to drive cars, so why not take a little time to learn about safe bicycling on our roads also? We would all benefit. The writer is a board member of Fairfax Advocates for Better Bicycling, but the views expressed are her own. Fionnuala makes a great point, if kids were taught the rules of the road at an earlier age, they would likely be better drivers once they get behind the wheel of a car. Not only would they already know basic rules of the road, they would likely be more tolerant of bicyclists out on the road. 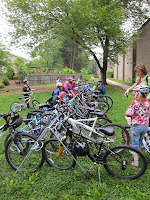 While Fairfax County has a fairly thorough bicycle education curriculum, especially in Grade 5, with 2 full sessions on bike safety, we've found that it is rarely taught. 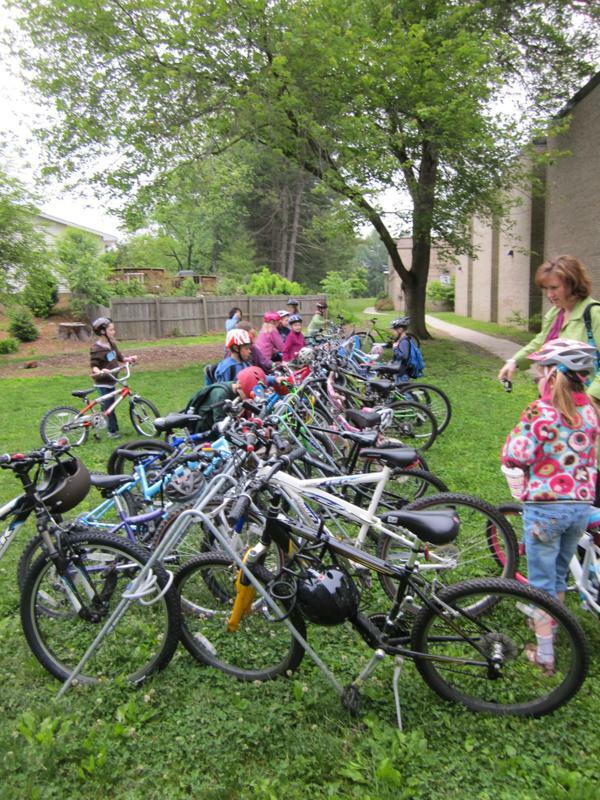 Did you or your kids receive any bike education in the Fairfax public schools? The article about the cyclist who was killed by an out-of-control SUV ["Cyclist, SUV driver killed in Va. crash," Metro, May 22] took a curious turn when Detective Scott Neville was quoted stating "you want to be careful about stereotyping, but..." The word "but" signals the bias to follow. The article alleges that "the majority of the half-dozen cyclist deaths [in Fairfax] in the past five years have involved Latino immigrants riding to or from work in the dark" — soft numbers but do the math. Perhaps three or four people of Latin descent were killed in cycling accidents in the past five years. This is far from a cultural revelation. It is fair to assume that workers who must bicycle to and from work in the dark are from a lower economic strata, but to link cycling deaths to ethnicity is absurd. Were any statistics kept describing the cultural identities of the vehicle drivers who caused these deaths? Perhaps a majority were white Anglo-Saxon Protestants. Equally absurd. 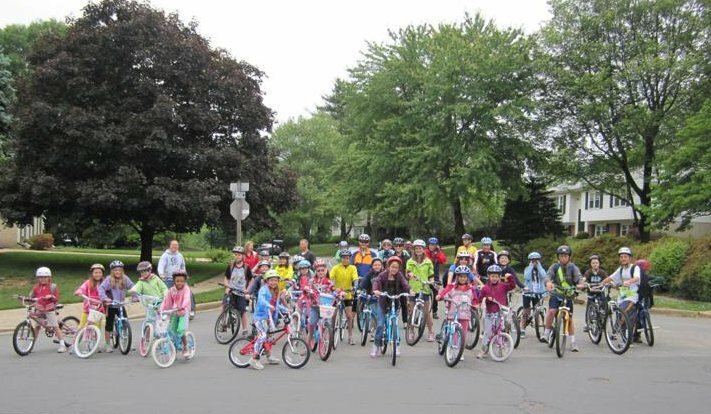 As we noted in an earlier post, parents at Wolf Trap Elementary School formed Wolfie's Bike Bus to allow kids to bike to school with parents during Bike/Walk to School Week. According to organizer, Jeff Anderson: “We had over 230 kids walk and over 50 bike today….which we figured out was more than 50% of the school enrollment,” he is happy to report. Car drop-offs over the week were cut nearly in half. On Bike to Work Day a cyclist was killed while riding on a trail adjacent to Lee Highway/Rt 29 at Forum Dr near the county government center. According to the police press release, the motorist was traveling north (east?) 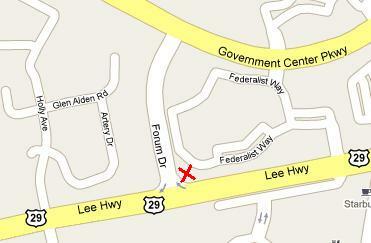 on Lee Hwy when he turned left onto Forum Dr. He struck two cyclists who were riding on the trail, killing one of them. The motorist then killed when the vehicle hit a tree. See a Google Map Streetview image of the location, which includes a pedestrian waiting to cross Forum Dr. It sounds like the bicyclist was entering the trail also headed north. The name of the bicyclist was not released. Traffic fatalities have dropped sharply in Fairfax in recent years, and records indicate that the cyclist's death might be the county's first in more than a year. The majority of the half-dozen cyclist deaths in the past five years have involved Latino immigrants riding to or from work in the dark. "You want to be careful about stereotyping, but you have to look at the circumstances," said Fairfax Detective Scott Neville, who investigates traffic fatalities. "As much as you hate to say it, it's often a certain socioeconomic class." Detective Neville is right, he needs to be careful about stereotyping. This is the same police spokesperson who in a Post article on Wed. on cyclist/motorist interactions stereotyped bike commuters by saying: "'The people who do it for sport generally handle their bikes pretty well,' said Detective Scott Neville, who investigates fatal accidents in Fairfax County. 'It's the people who are biking to and from work, without so much awareness or understanding of the law, who get into trouble.'" Does he have any data to back up this dubious claim? It could be that more Latino immigrants are being killed because they ride their bikes a lot. Many of them depend on bikes as their primary mode of transportation. They ride in all conditions, and usually bicycle conditions in Fairfax are not good. Maybe Detective Neville could stop stereotyping bicyclists and work with the county bike coordinator to improve bicycle conditions in the county. It appears that the cyclists in this most recent crash were doing nothing wrong and probably could not have avoided the crash. The cause of the crash is being investigated, but it looks like the motorist was incapacitated in some way (heart attack, drunk?). FABB plans to meet with Detective Neville to discuss bicycle safety in the county. As we reported earlier, at this year's National Bike Summit Transportation Secretary Ray LaHood announced new Federal policy recommendations to state DOT's to ensure that bicyclists and pedestrians are treated as equals with other transportation modes. As Secretary LaHood said at the time, "This is the end of favoring motorized transportation at the expense of non-motorized." The policy has received some pushback from a few highway special interest groups, including the trucking industry and the National Association of Manufacturers. LAB posted a good response to their mis-characterization of the policy. We were pleased to see the policy statement's acknowledgment of bicycling and walking as an important part of the transportation system. Bicycling and walking serve as cost-effective solutions to many of the serious issues facing our transportation system, including traffic congestion, funding concerns and air pollution. Moreover, as 40 percent of trips taken in our country are two miles or less, bicycling and walking should play an important role in providing transportation options in our small towns, suburbs and cities. At today's Reston Bike to Work Day pit stop we asked the crowd at various times during the event whether they received the Bicycle Commuter Tax Benefit. One person raised their hand during the entire time. One other employer, the winner of our Employer Challenge, National Wildlife Federation, also provides employees with the benefit. For example, today DOT gave its employees a new bicycle commuting benefit. We signed it into effect right on our front steps surrounded by the DOTers who participated in today's Bike To Work Day festivities. This program allows bicyclists to receive reimbursement for qualified commuting costs similar to that provided to employees who take public transportation to and from work. And I'm particularly proud that DOT is the first Cabinet-level agency to make this benefit available. Photo: US DOT employees who participated in Bike to Work Day. 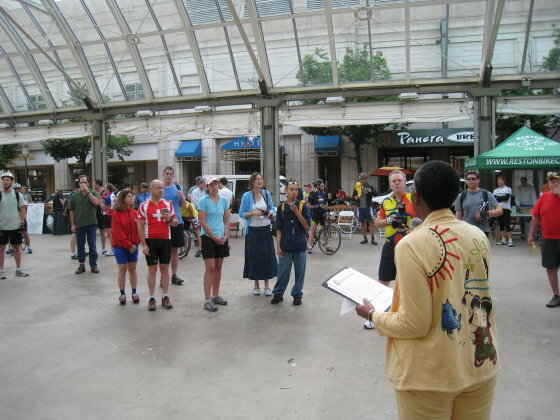 We had a large crowd at the Reston Bike to Work Day event that we help organize each year. We expected fewer participants this year with the new pit stop located nearby in Herndon. However, our registration numbers were about the same as last year and the turnout seemed to be greater with the excellent weather. National Wildlife Federation won the Employer Challenge by having the most bike-friendly business. Employees have a place to shower and change, they have bike parking (although it could be better), and they were the only employer in the challenge that has implemented the $20/month Bicycle Commuter Tax Provision. Their office is located adjacent to the W&OD Trail and employees have access to a fleet of bicycles for taking short trips during the day. They also have a Cool-It Commuting Committee to promote alternative commuting options and solutions for employees. Congratulations to National Wildlife Federation. Photos: Top - Rob Henenlotter at the FABB table. Bottom - Supervisor Hudgins addresses the crowd. This video has been making the rounds lately. We've received several references to it so here it is. This is what rush hour in a part of Utrecht, Netherlands looks like: thousands of bicyclists, many pedestrians, lots of trams and other transit, and a few cars. Very few cyclists run the red light. It's very much organized chaos (especially at this speed, the video is 4 times faster than reality, 8 minutes condensed to 2) but it works. "About 60 percent of the drivers are positive," Harburg said as she locked her bike a few minutes later. "And 40 percent are negative, and when I say negative, mostly I mean just not aware. About 10 percent of them just don't like bikers. They shout at you, 'Get off the Road!' or beep just to try to scare you to death." "The people who do it for sport generally handle their bikes pretty well," said Detective Scott Neville, who investigates fatal accidents in Fairfax County. "It's the people who are biking to and from work, without so much awareness or understanding of the law, who get into trouble." Competitive cyclists may know how to handle their bikes better but in my experience they are some of the most blatant offenders when it comes to obeying traffic rules (behind bike messengers). Bike commuters are out there every day and most know the consequences of bad behavior. They usually travel alone, not in race packs where there's strength in numbers and more incentive to blow through lights and stop signs. As more people decide to go by bike, motorists will learn that they need to share the road. I think attitudes are changing slowly. I see more cyclists on the roads every day and motorist behavior seems to be getting ever so slightly better. For a change the weather forecast looks great for Bike to Work Day tomorrow; warm and mostly sunny, with a predicted high of 88°. Hope everyone has a great day. Somehow Virginia jumped 5 places in the bicycle friendly state rankings recently released by the League of American Bicyclists. Virginia is now ranked 18th. Even though the three feet to pass bill failed this year, Virginia is tied for 6th in the Legislation category. We are dead last in Enforcement: "The Enforcement section the BFS questionnaire gathers data on the types of training law enforcement officers and traffic court judges receive to ensure protection of cyclists' rights to the road and safe travel on our shared roadways." Looks like we've got some work to do educating police and judges. Approximately 35 Wolftrap Elementary School students took Wolfie's bike bus this morning as part of Bike/Walk to School Week. The bus was organized by Jeff Anderson, a Wolftrap ES parent. The cyclists rode about 2 miles through neighborhoods starting at Liberty Tree Lane, picking up other cyclists along the way. The kids had a great time, many riding to school for the first time, several wanting to ride again tomorrow. Let's hope the bike bus becomes a regular way for Wolftrap kids to get to school. Thanks to bikes@vienna for providing the bike racks. Read more about bicycle buses (or bicycle trains as they are sometimes called) and about Safe Routes to School. That's the title of an article in the May-June edition of Viva Tysons! magazine. 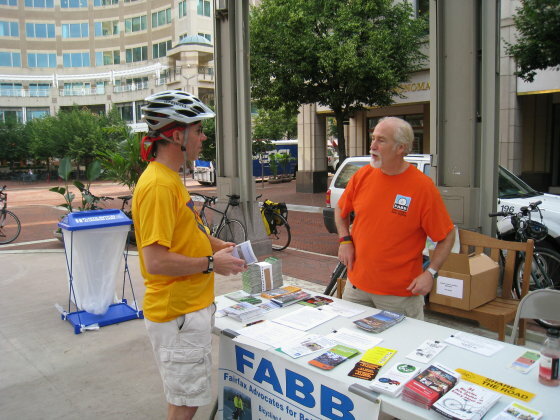 FABB was asked to put together the article on bicycling in Tysons, now and in the future. Hunter and I wrote the article with help from Alan and Chris. How many of us have sat in traffic and thought, "I could walk there faster than this." In fact, in today's beep and creep standard of car transportation a bike will almost always get you there more quickly for shorter trips. Consider this: A typical bike rider of only moderate fitness can cover five miles in 30 minutes. That makes all of Tysons corner an easy bike ride in 15-20 minutes. Try getting from one end of Tysons to the other in a car any faster and find parking. Chris French, an information technology professional employed by one of Tysons Corner's largest employers - Science Applications International Corporation (SAIC) - commutes each day by bike from his home in Oakton into the heart of Tysons Corner. With no on-road cycling facilities on any stretch of his commute, French practices 'vehicular cycling' - the practice of driving a bicycle on the roadway in a manner that is visible, predictable, and in accordance with the principles for driving a vehicle in traffic. French rides on Courthouse Road through Vienna, crosses over Route 123 and continues north on Church Street. After traversing Glyndon Park, he continues north across Beulah Road using Creek Crossing Road, and then skirts the edge of the Westwood Country Club as he approaches Tysons from the south. 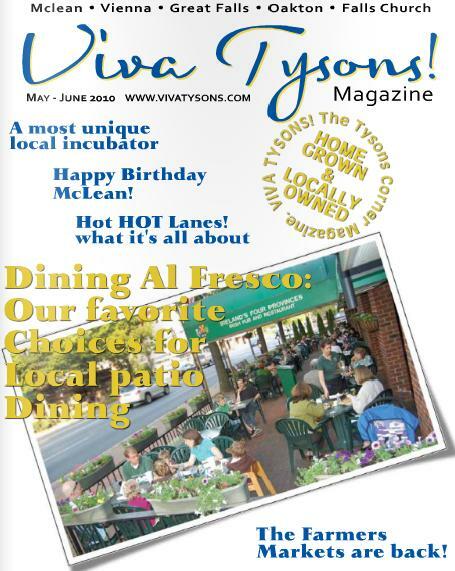 To read the full article, go to the Viva Tysons! Archived Issues page and click on the May-June Issue (Flash). The article starts on p. 68. With Bike to Work Day coming up this Friday, May 21, there isn't a better time than now to use your bike for transportation. Many of us do already, but bikes are used for a small minority of trips. As the Gulf of Mexico fills with oil, why not kick the oil habit and leave the car behind and use your bike for as many local trips as you can? The Today Show recently did a segment on Bike to Work Day coming up on Friday May 21 (register at WABA.org). The Today Show staff tested three transportation modes, starting at the same location and traveling to their office by bike, transit, and car. To paraphrase Al Roker, the bike rider, 50% of our commutes are under 5 miles so there's got to be a better way than driving to work alone, burning fossil fuels, getting frustrated in traffic, and spending lots of money. It really doesn't make sense for so many people to travel so many places alone in single occupant vehicles, and yet we continue to do it every day. Al won the challenge on what looked like a Brompton folding bike, Matt Lauer took transit and came in second, and Meredith Vieira drove and came in dead last. Transportation Alternatives of NYC helped out with the bicycling logistics. We reported on the Car-Free Diet Skeptics Challenge a while back (in Arlington of course). The Challenge is sponsored by Arlington County Commuter Services. One of the skeptics, Ross, said he would sell his car as part of the challenge and sure enough, yesterday he made good on his promise and sold his late model car, appropriately enough in Fairfax County. The skeptics are discovering many of the ways to get around Northern Virginia without cars. It takes some planning and a little more time, but it's worth the effort. The skeptics have done a good job of sharing their experiences on their blog. Thanks guys for setting an example for the rest of us. Shouldn't we all be thinking twice about getting in our cars alone, feeding our oil addiction while the Gulf fills with oil? Also check out the Car-Free Diet Blog. McCleary and Wright, both active members of Fairfax Advocates for Better Bicycling, want Fairfax County to invest in developing a countywide bike master plan, equivalent to county plans for future road needs. "Every success story around the country has been preceded by a bike plan," McCleary said. The group also would like to see increased requirements or incentives for office buildings to include bike parking and shower facilities to accommodate bicycle commuters, similar to Arlington County. However, major new investments might be on hold for the time being, as county supervisors eliminated $213,641 in funding for the bike program -- most of the agency's operating budget -- when they approved the fiscal 2011 budget. "Somehow Arlington was able to find $1 million a year for their bike program," Wright said. "If [Fairfax County supervisors] really think it's a viable form of transportation, they would find the money to fund it." Update: The Post carried the same article in today's Local Living Section, Bike to Work Day builds interest in alternative to cars. Saturday, May 22, 9 a.m., Community Center Community Room, 223 Little Falls St.
Saturday, May 22, 11 a.m., Thomas Jefferson Elementary School gym, 601 S. Oak St.
Wednesday, June 2, 7 p.m., Community Center Art Room, 223 Little Falls St.
First Lady Michelle Obama heads the Childhood Obesity Task Force with a "goal to solve the problem of childhood obesity within a generation." Today the task force released their action plan. 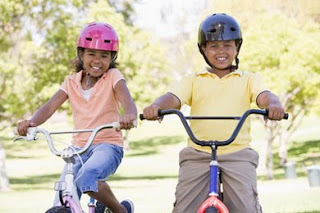 According to Transportation Secretary Ray LaHood in his blog entry DOT, First Lady & Childhood Obesity Task Force share important goal: Let's Move! Here at DOT we support the First Lady's efforts wholeheartedly, and we're particularly interested in the report's Chapter V: Increasing Physical Activity, which includes a section on "The Built Environment." We know that our "all-digital-all-the-time world" doesn't always encourage us to live the healthiest lives we can. That's why we're working hard to make it easier for Americans to walk or bike safely in their communities. And when kids see that more adults are choosing to walk or bike, they are more likely to exercise healthier transportation options. And walking and biking aren't just good for our health; they're good for our environment, and they're ways of getting around that Americans have said they want. That's why, in March, we announced our new bicycle and pedestrian policy initiative. That's why, last year, we established our Livability Principles. That's why we support Safe Routes to School programs. That's why we support Complete Streets . That's why we've used TIGER discretionary funds to support projects that benefit their communities. Fairfax County transportation staff have outlined a number of possible options for funding Tysons transportation projects between now and 2030, "Funding Tysons Transportation Improvements". While we understand that bike facilities are included on many of the roads as part of the Tysons Bicycle Network, it would have been nice if there were a mention of bicycles in the funding document. There is no identified funding for bicycle connections to the surrounding communities. Having great bicycle facilities in Tysons in 2030 isn't going to help bicyclists who live outside of Tysons who cannot currently easily access Tysons by bike. 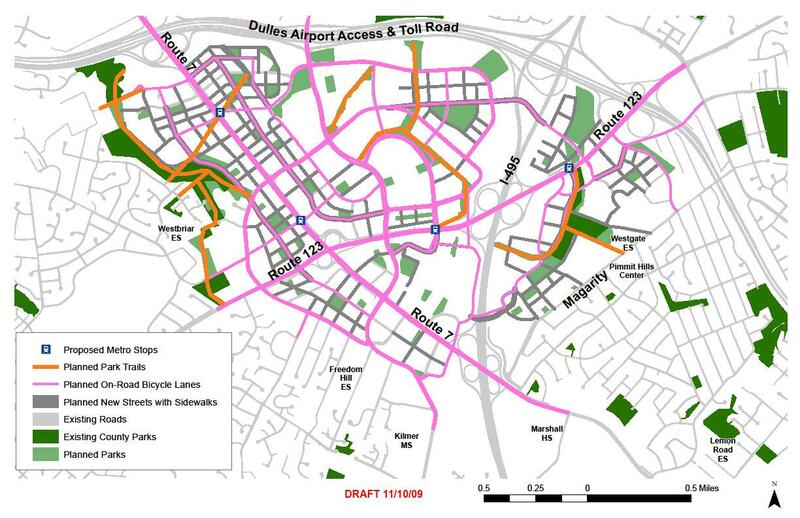 The Tysons bicycle planning effort will identify many needed improvements. Because that planning effort was not included in the original transportation planning contract, there are no cost estimates for these improvements. However, some funds should be identified now for these anticipated needs. We pointed this out during our testimony at the Tysons public hearing before the Planning Commission, but it's still not included in the most recent markup of the proposed plan text. The Board of Supervisors Public Hearing is planned for June 22 at 4:30 pm. See the post article Fairfax County outlines tax options for Tysons Corner road projects. 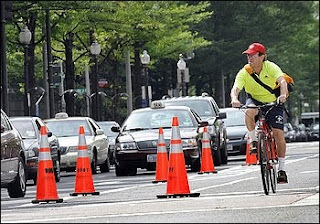 See comments on the earlier post AAA Mid-Atlantic bashes Pennsylvania Ave. bike lanes. One is from someone who works for AAA Mid-Atlantic and the other is an official response received from AAA Mid-Atlantic. Both claim there was not enough public review of the project which has been part of the DC Bicycle Master Plan since 2005. That process included considerable public comment and review. Calling for an Environmental Impact Study now is the same tactic used in San Francisco to block any new bike projects for three years. Bike lanes to allow more people to use bicycles for transportation (20% of all drivers want to go by bike according to AAA Mid-Atlantic) should be a win-win for all users of the transportation system. We hope AAA Mid-Atlantic recognizes that and supports future bike lane projects. 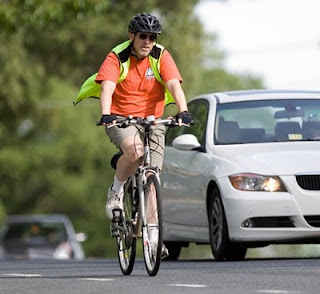 Labels: aaa mid-atlantic, bike lanes, pennsylvania ave.
"On Tuesday, May 11, at 6 p.m., Supervisor Andrea McGimsey (D-Potomac) and other county officials will provide an update on county initiatives to bring safer and improved bicycle and pedestrian access to the Potomac District." "The county is seeking residents' feedback about where and how they think the county can improve pedestrian and bicycle access and safety. The meeting will include an overview of present and past initiatives, including the proposed Pedestrian and Bicycle Improvements for Atlantic Boulevard Corridor and the proposed rezoning of Dulles Town Center. "Staff from the Virginia Department of Transportation and Loudoun County will be available to answer questions. The event will take place at 21641 Ridgetop Circle, Suite 100 in Sterling." See our earlier reports on bicycle access along Atlantic Blvd. The Comstock development at Wiehle Ave station, which county staff initially recommended be denied, was recently approved by the Planning Commission. This development is adjacent to the planned Wiehle Ave Metro station, across the street from the W&OD Trail. As required by Metro, the developer will provide 150 Metro bicycle parking spaces inside the garage. 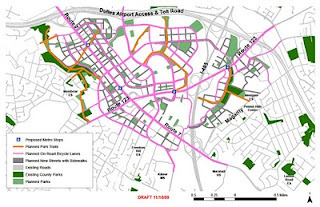 In 2008 the Reston Metro Access Group issued their final report which recommended shared bus/bike lanes at the western entrance to the site from the W&OD Trail, a better trail connection on the eastern entrance, and bike lanes on the road through the development. None of these recommendations were included in the proposal approved by the Planning Commission. While VDOT participated in the 2008 planning process, other VDOT staff had concerns about the proposals and the developer complained about limited right of way. Why conduct a study, spend over a year and lots of money for a consultant, and then ignore the recommendations? This is not a good precedent to set for future development around these new Metro stations. Without a plan for bicycle access to the site, cyclists will be left to contend for space with pedestrians or motorists. When asked how cyclists would access the site we were told by the developer that cyclists would dismount and walk to the bike parking area in the middle of the development. Since the county does not yet have bicycle parking requirements, the applicant is offering far fewer spaces than needed. Arlington County requires 1 space for every 3 residential units and 1 visitor space for every 50 units. Comstock is providing 1 space for every 20 units and visitor parking numbers aren't specified. Arlington offers specific guidelines for parking. Comstock can stick their bike parking in some unusable space in the parking garage as was done throughout the Reston Town Center. We had been cautiously optimistic with the bicycle recommendations in the Reston Metro Access Group final report. That cautiousness was well-founded and the optimism has turned to pessimism. We were hampered in our evaluation of the final staff report since the text in the pdf file is not searchable. Trying searching for bicycle parking by looking page by page in a 226 page document. Is it that difficult to create a searchable pdf file? Most cyclists that I know drive cars. Maybe not as much as other people, but we use cars to go on longer trips, sometimes for grocery shopping, and for many of the other trips that we don't take by bike. Many of us also purchase travel services, either from our primary auto insurance company or from groups like AAA or Better World Club. If you are a member of AAA Mid-Atlantic you might want to think twice about your membership. NEW BIKE LANES COULD MAKE A BAD THING WORSE IN DOWNTOWN WASHINGTON, SAYS AAA: Protected Bike Lane Project Would Remove Six Miles Of Traffic Lane; New Bike Lanes Won't Entice District Motorists Out Of Cars, AAA Poll Shows. That's the (long) title of a recent AAA press release that is very critical of the Pennsylvania Ave. bike lanes. AAA claims that "It is unlikely the addition of new bike lanes in Washington's Central Business District will entice most motorists out of their cars or attract more residents to bicycling to work. That's according to the findings of AAA Mid-Atlantic's latest survey of District motorists." But then they state that "20 percent of surveyed AAA members in the District said the changes would compel them to become regular bicycle commuters." Just think what a 20% bicycle mode share could mean for the District. "Motorists are concerned that congestion will become even more pronounced because reductions in lane width generally trigger reductions in traffic flow, travel times and capacity. That’s the biggest issue." In fact, according to FHWA, reducing lane width in "reduced-speed urban environments" is commonly used to create bike lanes and narrow crossing distance for pedestrians and has little impact on traffic. AAA Mid-Atlantic "is encouraging commuters and District motorists to voice their concerns about the proposal." We encourage you to voice your concerns to AAA Mid-Atlantic to let them know you don't appreciate your membership money going toward bicycle-bashing press releases. You can also let the Transportation Planning Board know that you support DDOT's bike lane proposal in the 2010 Draft update to the CLRP. By the way, Better World Club has a Bike road assistance program that includes Bike Discounts, information on traveling with your bike and more. We're members and in our opinion, they are a much better option for travel services. Labels: bike lanes, pennsylvania ave.
On Monday the National Physical Activity Plan was released. The plan was developed by several public and private groups including the Centers for Disease Control and Prevention, the American College of Sports Medicine, the American Heart Association and the American Cancer Society. One day, most kids may jump on their bikes and ride to school. While they're there, they'll be playing active games in high-caliber physical education classes and doing lots of fun recreational activities before and after school. Adults should be able to walk, bike or jog to work, the grocery store or a local park or community recreation center, where they will be able play golf or tennis or take exercise classes. And doctors may talk to their patients about an important new "vital sign" - their physical activity level. Transportation systems, development patterns, and community design and planning decisions all can have profound effects on physical activity. People can lead healthier, more active lives if our communities are built to facilitate safe walking and biking and the use of public transportation, all considered forms of active transportation. 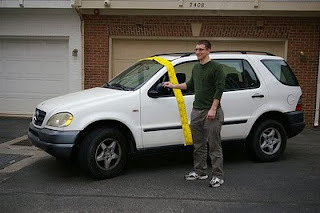 In 2001, the average American spent 64 minutes per day in a vehicle. Almost three quarters of Americans feel they currently have no choice but to drive as much as we do. Providing more transportation options can help us achieve our recommended levels of physical activity, while lowering pollution rates and increasing access to essential destinations like grocery stores, schools, jobs and health care services. A few FABB members got together last night at Auld Shebeen in Fairfax City to celebrate 5 years of bicycle advocacy in Fairfax County. Some of the people who attended the very first meeting were on hand to reminisce about our work over the past 5 years. It was appropriate that we sat under a sign that read "Connolly Station" (in the upper right under the clock in the photo). It was under the leadership of Chairman Gerry Connolly that the Board of Supervisors approved the creation of the bike coordinator position, funding for the county bicycle map, and funding for on-road bike projects. Since that time we've made progress but support for the comprehensive bicycle initiative created by now-Congressman Connolly hasn't been the same among Board members. We hope to get back on track as the economy improves over the coming years. Later in the evening we were joined by folks from the GMU Bike Village. They rode over from the nearby campus, serenaded by Antoine's great music-in-a-footlocker that he tows behind his bike. It's powered by a car battery. It would make a great lead vehicle for a future critical mass (or critical manners) ride through the streets of Fairfax later this summer. Stay tuned. 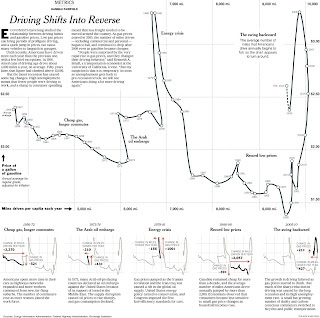 We came across a recent post on A Practical Cyclist describing a New York Times graphic showing the relationship between the price of gas and the number of miles driven in the U.S. Each year is represented by a point along a line. The line shows the price of gas and the miles driven per capita. From 1960 to today the number of miles driven per year has increased from about 4,000 to just under 10,000. When gas was cheap, between 1986 and 2003 the number of miles driven per year increased from around 7,500 to around 10,000. With the rise in the price of gas in 2005 the number of miles driven slowly decreased. Even after the decrease in gas prices miles driven decreased. I wonder how much of that increase in miles driven is attributable to parents driving their kids to school? The number of kids walking and biking to school has decreased steadily since 1960. Between 1969 and 2001 the percentage of kids who walked or biked to school decreased from 43% to 16%. 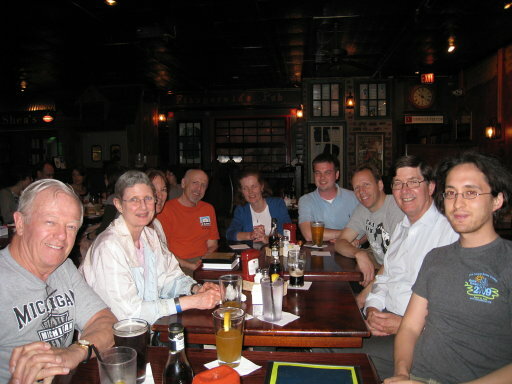 The first FABB meeting was held on May 3, 2005 at bikes@vienna (Where we met monthly for several years. Thanks John). A small group of cyclists discussed the need for more bicycle advocacy in Fairfax, County and City. Our early goals were for the county to create a bike coordinator position, to develop a county bike map, and to develop on-road bike routes. We created a petition to urge the Board of Supervisors "to act immediately by building more bicycle-friendly communities and dedicating a full-time County staff person to planning and implementing bicycle projects." We then collected signatures during Bike to Work Day later that month. Those first names formed the basis of the FABB contacts list that now contains 850 email addresses. If you didn't receive the May-June 2010 FABB newsletter today, then you're not on the list. Send a message to chairman@fabb-bikes.org to receive the newsletter. To celebrate our 5th anniversary everyone is invited to Auld Shebeen in Fairfax City starting at 5:30 p.m. Bike parking is available in a few scattered spots including the nearby library. There's also a railing behind Auld Shebeen that can be used for locking bikes.